Icing, in general, is any deposit or coating of ice on an object, caused by the impingement and freezing of liquid (usually supercooled) hydrometeors; to be distinguished from hoarfrost in that the latter results from the deposition of water vapor. The size of droplets affects the rate of catch. Small drops tend to follow the airflow and are carried around the wing. Large, heavy drops tend to strike the wing. When a small drop does hit, it will spread back over the wing only a small distance. The large drop spreads farther. As for airspeed, the number of droplets struck by the aircraft in a certain time increases as the airspeed increases. The curvature of the leading edge of the wing also has an effect on the rate of catch. Thin wings catch more droplets than do thick wings. The rate of catch is, therefore, greatest for an aircraft with thin wings flying at high speed through a cloud with large droplets and a high liquid water content. NOTE: If an aircraft has been in below freezing temperatures and then is located in above freezing temperatures, the aircraft's surface temperature can remain below freezing for some time. Therefore icing still may be possible in temperatures that are above freezing. NOTE: Supercooled liquid water droplets predominantly found at temperatures ranging from 0°C to -20°C. Although rare, small amounts of supercooled water droplets can be found at temperatures as cold as -40°C. The smaller and purer the droplets, the lower are their freezing points. NOTE: When a supercooled droplet strikes an object such as the surface of an aircraft, the impact destroys the internal stability of the droplet and raises its freezing temperature. This is known as aerodynamic heating - the temperature rise resulting from adiabatic compression and friction as the aircraft penetrates the air. Ice collects on and seriously hampers the function of not only wings and control surfaces and propellers, but also windscreens and canopies, radio antennas, pilot tubes and static vents, carburetors and air intakes. Turbine engines are especially vulnerable. Ice forming on the intake cowling constricts the air intake. Ice on the rotor and starter blades affects their performance and efficiency and may result in flame out. Chunks of ice breaking off may be sucked into the engine and cause structural damage. The first structures to accumulate ice are the surfaces with thin leading edges: antennas, propeller blades, horizontal stabilizers, rudder, and landing gear struts. Usually the pencil-thin outside air temperature gauge is the first place where ice forms on an airplane. The wings are normally the last structural component to collect ice. Sometimes, a thin coating of ice will form on the windshield, preceded in some instances by frosting. This can occur on take-off and landing and with sufficient rapidity to obscure the runway and other landmarks during a critical time in flight. Icing of the propeller generally makes itself known by a slow loss of power and a gradual onset of engine roughness. The ice first forms on the spinner or propeller dome and then spreads to the blades themselves. Ice customarily accumulates unevenly on the blades, throwing them out of balance. The resulting vibration places undue stress on the blades and on the engine mounts, leading to their possible failure. If the propeller is building up ice, it is almost certain that the same thing is happening on the wings, tail surfaces and other projections. The weight of the accumulated ice is less serious than the disruption of the airflow around the wings and tail surfaces. 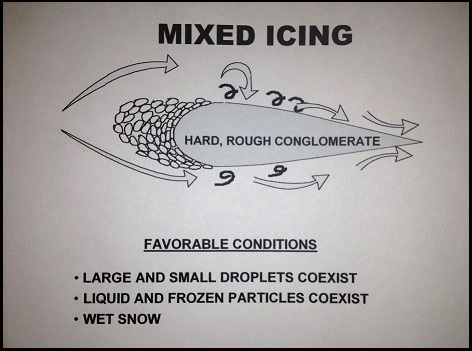 The ice changes the airfoil cross section and destroys lift, increases drag and raises the stalling speed. At the same time, thrust is degraded because of ice on the propeller blades and the pilot finds himself having to use full power and a high angle of attack just to maintain altitude. With the high angle of attack, ice will start to form on the underside of the wing adding still more weight and drag. Landing approaches and landing itself can be particularly hazardous under icing conditions. Pilots should use more power and speed than usual when landing an ice-laden airplane. If ice builds up on the pilot tube and static pressure ports, flight instruments may cease operating. The altimeter, airspeed and rate of climb would be affected. Gyroscopic instruments powered by a venturi would be affected by ice building up on the venturi throat. Ice on radio antennas can impede VOR reception and destroy all communications with the ground. Whip antennas may break off under the weight of the accumulating ice. Clear ice or glaze ice is a heavy coating of glassy ice which forms when flying in areas with high concentration of large supercooled water droplets, such as cumuliform clouds and freezing rain. It spreads, often unevenly, over wing and tail surfaces, propeller blades, antennas, etc. Clear ice forms when only a small part of the supercooled water droplet freezes on impact. The temperature of the aircraft skin rises to 0°C with the heat released during that initial freezing by impact of the part of the droplet. A large portion of the droplet is left to spread out, mingle with other droplets before slowly and finally freezing. A solid sheet of clear ice thus forms with no embedded air bubbles to weaken its structure. As more ice accumulates, the ice builds up into a single or double horn shape that projects ahead of the wing, tail surface, antenna, etc. on which it is collecting. 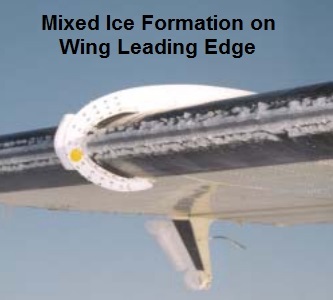 This unique ice formation severely disrupts the airflow and is responsible for an increase in drag that may be as much as 300 to 500%. The danger of clear ice is great owing to (1) the loss of lift, because of the altered wing camber and the disruption of the smooth flow of air over the wing and tail surfaces, (2) the increase in drag on account of the enlarged profile area of the wings. (3) the weight of the large mass of ice which may accumulate in a short time, and finally (4) the vibration caused by the unequal loading on the wings and on the blades of the propeller(s). When large blocks break off, the vibration may become severe enough to seriously impair the structure of the airplane. When mixed with snow or sleet, clear ice may have a whitish appearance. (This was once classified as rime-glazed but it is now considered to be a form of clear ice). Rime ice is an opaque, or milky white, deposit of ice that forms when the airplane is flying through filmy/stratiform clouds. It is dependent on a low rate of catch of small supercooled water droplets. It accumulates on the leading edges of wings and on antennas, pilot heads, etc. 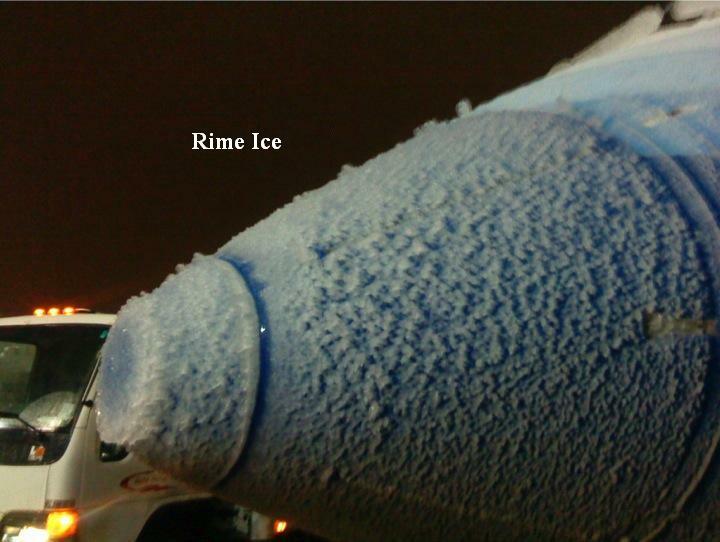 For rime to form, the aircraft skin must be at a temperature below 0°C. The drop will then freeze completely and quickly without spreading from the point of impact. Thus, the droplets retain their spherical shape as they freeze, creating air packets between the frozen particles. This process creates an irregular shape of the ice. The deposit has no great weight, but its danger lies in the aerodynamic alteration of the wing camber and in the choking of the orifices of the carburetor and instruments. 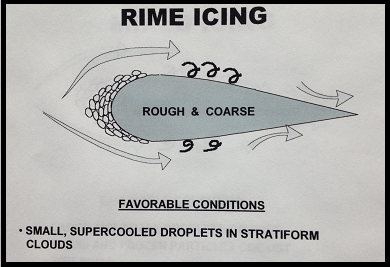 Rime is usually brittle and can easily be dislodged by de-icing equipment. Occasionally, both rime and clear ice will form concurrently. This is called mixed icing and has the bad features of both types. Mixed icing, as the name implies, has the properties of both clear and rime icing. Large and small supercooled droplets coexist. Appearance is whitish, irregular and rough. Favorable conditions include liquid and frozen particles found in the colder portion of the cumuliform cloud and wet snow flakes. The formation process for mixing icing includes that of clear and rime icing. Mixed ice can accumulate rapidly and is difficult to remove. 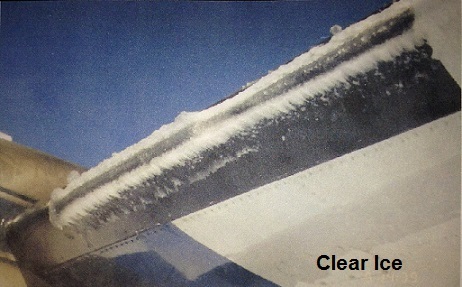 A white semi-crystalline frost which covers the surface of the airplane forms in clear air by the process of deposition. This has little or no effect on flying but may obscure vision by coating the windshield. It may also interfere with radio by coating the antenna with ice. It generally forms in clear air when a cold aircraft enters warmer and damper air during a steep descent. 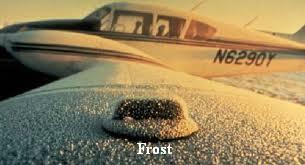 Aircraft parked outside on clear cold nights are likely to be coated with frost by morning. The upper surfaces of the aircraft cool by radiation to a temperature below that of the surrounding air. Frost which forms on wings, tail and control surfaces must be removed before take-off. Frost alters the aerodynamic characteristics of the wing sufficiently to interfere with take-off by increasing stall speed and reducing lift. Frozen dew may also form on aircraft parked outside on a night when temperatures are just below freezing. Dew first condenses on the aircraft skin and then freezes as the surface of the aircraft cools. Frozen dew is usually clear and somewhat crystalline, whereas frost is white and feathery. Frozen dew, like frost, must be removed before take-off. In fact, any snow or moisture of any kind should be removed since these may freeze to the surface while the airplane is taxiing out for take-off. The heat loss due to the forward speed of the airplane may be sufficient to cause congelation. Icing may be described as light, moderate, and severe (or heavy). In severe icing conditions, the rate of accretion is such that anti-icing and de-icing may fail to reduce or control the hazard. A change in heading and altitude is considered essential. In moderate icing, a diversion may be essential since the rate of accretion is such that there is potential for a hazardous situation. Light icing is usually not a problem unless the aircraft is exposed for a lengthy period. Clear ice is considered more serious than rime ice since the rate of catch must be high to precipitate the formation of clear ice. The seriousness of an icing situation is, of course, dependent on the type of aircraft and the type of de-icing or anti-icing equipment with which the aircraft is equipped or the lack of such equipment. Cumulus. Severe icing is likely to occur in the upper half of heavy cumulus clouds approaching the mature cumulonimbus stage especially when the temperatures are between 0°C and -25°C. The horizontal extent of such cloud is, however, limited so that the aircraft is exposed for only a short time. The zone of probable icing in cumuliform clouds is smaller horizontally but greater vertically than in stratiform clouds. Further, icing is more variable in cumuliform clouds because many of the factors conducive to icing depend to a large degree on the stage of development of the particular cloud. Icing intensities may range from generally a trace in small supercooled cumulus to often light or moderate in cumulus congestus and cumulonimbus. Icing is generally restricted to the updraft regions in a mature cumulonimbus, and to a shallow layer near the freezing level in a dissipating thunderstorm. Icing in cumuliform clouds is usually clear to mixed. Stratus. Icing is usually less severe in layer cloud than in cumulus type clouds but it can be serious if the cloud has a high water content. Since stratus cloud is widespread in the horizontal, exposure to the icing condition can be prolonged. Icing is more severe if cumulus clouds are embedded in the stratus layer. The likelihood of structural icing is greatest in the temperature range from 0°C to -10°C. The likelihood decreases, but is still possible between -10°C to -20°C. 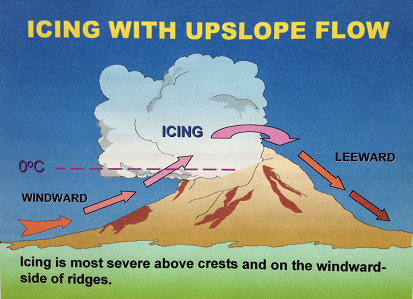 Research findings indicate icing is most intense near the top of stratiform clouds. The vertical extent of icing layers does not usually exceed 3,000 feet (a change in altitude of only a few thousand feet may take the aircraft out of icing conditions, even if it remains in clouds). Freezing Rain is common ahead of warm fronts in winter. 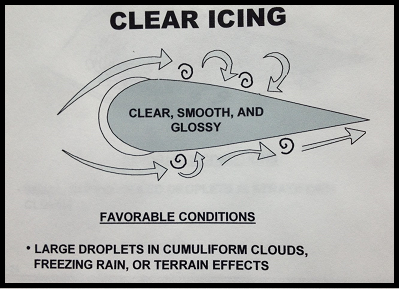 Serious icing occurs when the aircraft is flying near the top of the cold air mass beneath a deep layer of warm air. Rain drops are much larger than cloud droplets and therefore give a very high rate of catch. In freezing temperatures, they form clear ice. Freezing Drizzle. Drizzle falls from stratus clouds with a high water content. As the droplets fall through the clear air , prompt action on the radio is important when icing starts. Information about the latest weather for altitudes above and below will help the pilot to make the decision on what action to take. The final alternative would be to turn back, or, if the accumulation of ice has already become serious, to make a precautionary landing immediately. In any event, the decision must be made rapidly since once ice has started to form, the condition may become critical in a matter of approximately six minutes. It is rather difficult to represent frontal icing conditions by an idealized model, since the structure of the clouds in frontal regions and in regions of intense low-pressure systems is very complex. In general, frontal clouds have a higher icing probability than other clouds. It has been estimated that 85 percent of the observed aircraft icing occurs in the vicinity of frontal zones. Usually, the greatest horizontal extent of icing is associated with warm fronts, and the most intense icing with cold front. 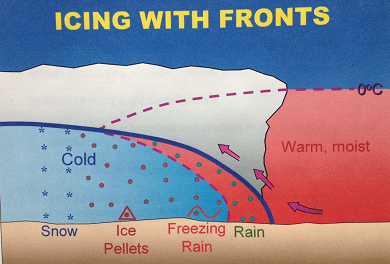 Warm Frontal Icing: This may occur both above and below the frontal surface. Moderate or severe clear icing usually occurs where freezing rain or freezing drizzle falls through the cold air beneath the front. This condition is most often found when the temperature above the frontal inversion is warmer than 0°C and the temperature below is colder than 0°C. Icing above the warm frontal surface, in regions where the cloud temperatures are colder than 0°C, is usually confined to a layer less than 3,000 feet thick. Research studies indicate that there is a definite possibility of moderate icing, usually mixed or clear, within 100 to 200 miles ahead of the warm-front surface position. This was particularly noticeable for fast-moving, active, warm fronts. Light rime ice was noted in the altostratus up to 300 miles ahead of the warm-front surface position. Cold Frontal Icing: Whereas warm-frontal icing is generally widespread, icing associated with cold fronts is usually spotty. Its horizontal extent is less, and the areas of moderate icing are localized. Clear icing is usually limited to supercooled cumuliform clouds within 100 miles to the rear of the cold-front surface position, and is usually most intense immediately above the frontal zone. Light icing is often encountered in the extensive layers of supercooled stratocumulus clouds which frequently exist behind cold fronts. Icing in the stratiform clouds of the widespread anafront type of cold front cloud-shield is more like icing associated with warm front. Other Frontal Icing: Icing conditions associated with occluded and stationary fronts are similar to those of a warm or cold front, depending on which type the occlusion or stationary front most resembles. Moderate icing conditions are frequently associated with deep, cold, low-pressure areas in which the frontal systems are quite diffuse. High or steep terrain, particularly mountains, causes icing to be more intense than is usual under identical conditions over low, flat terrain. Icing is greater over the ridges than over valleys and greater on the windward side than on the leeward side. Moderate icing, usually clear, is commonly experienced in convective clouds over mountainous terrain. Windward, mountainous coasts in winter are especially subject to extensive aircraft-icing zones. The lifting of the fresh maritime polar air by the mountains results in the formation of more-or-less continuous supercooled clouds. Also, the orographically-induced updrafts permit the air to support larger cloud droplets than otherwise, so that the icing is more intense. Avoid flight into an area where icing conditions are known to exist. Do not fly through rain showers or wet snow when the temperature is near 0°C. 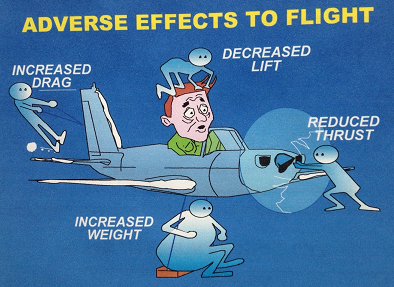 Do not fly into cumulus clouds when the temperature is low. Always consult a weather office or flight service station to obtain a forecast about expected icing conditions before taking off on any flight in fall or winter. 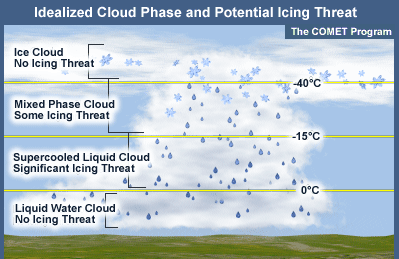 Icing in freezing drizzle is usually maximum just below the cloud base where the drops are largest. Icing is of the clear ice type. Snow and Ice Crystals colder than -20°C do not adhere to cold aircraft and do not usually constitute an icing problem. However, if the aircraft is warm, the snow may melt as it strikes the warm surface and ice accretion may result. If supercooled water droplets are also present with the snow, a rapid build up of rough ice can occur. Many modern airplanes that are designed for personal and corporate use, as well as the larger transport type airplanes, are fitted with various systems designed to prevent ice from forming (anti-icers) or to remove ice after it has formed (de-icers). 1. Fluids. There are fluids which are released through slinger rings or porous leading edge members to flow over the blades of the propellers and the surfaces of the wings. A fluid is an anti-icing device since it makes it difficult for ice to form. 2. Rubber Boots. Membranes of rubber are attached to the leading edges. They can be made to pulsate in such a way that ice is cracked and broken off after it has already formed. This is a de-icing device. 3. Heating Devices. Heating vulnerable areas is a method for preventing the buildup of ice. Hot air from the engine or special heaters is ducted to the leading edges of wings, empennages, etc. Electrically heated coils protect pilot tubes, propellers, etc. Few single engine airplanes, or even light twin-engine types incorporate any means of ice prevention. A few tips for pilots flying airplanes in this category will therefore be in order. When ice formation is observed in flight, there is only one certain method of avoiding its hazards and that is to get out of the ice-forming layer as quickly as possible. This may be done by climbing above the ice forming zone. This alternative would obviously require an airplane that has good performance and is fitted with radio and proper instruments for flying over the top. The next alternative would be to descend and fly contact below the ice forming zone. The advisability of this course would depend on the ceiling and visibility along the route at the lower level concerned. Do not remain in icing conditions any longer than necessary. For that reason, during climbs or descents through a layer in which icing conditions exist, plan your ascent or descent to be in the layer for as short a time as possible. However, keep your speed as slow as possible consistent with safety. Speed of an airplane affects accretion of ice. The faster an airplane moves through an area of supercooled water drops, the more moisture it encounters and the faster will be the accumulation of ice. If ice has started to build up on the airplane, do not make steep turns or climb too fast since stalling speed is affected by ice accumulation. Fuel consumption is greater due to increased drag and the additional power required. Land with more speed and power than usual. Do not land with power off. With the advent of the jet age, the problem of icing has taken on some surprising new aspects. At one time, the pilots of airplanes flying through high cirrus clouds did not worry about ice forming on the airplane as cirrus clouds are composed of ice crystals rather than water droplets. With the increased speeds of which jet airplanes are capable, the heat of friction is sufficient to turn the ice crystals in the cloud to liquid droplets which subsequently freeze to the airplane.